If you follow this blog, you might remember this post. A colomnist for our local paper wrote an opinion piece criticizing Dowling Catholic High School for not wanting to honor a Planned Parenthood supporter and one time board member. Our bishop wrote a letter to the editor in response. Here it is in full. “I regret not having been able to respond to two recent columns by Rekha Basu about the Dowling Catholic High School Distinguished Alumna Award at the time Ms. Basu sought comment. I was prevented from doing so until now by a trip from Aug. 30 to Sept. 8 that included 22 hours in transit each way to Côte d’Ivoire, Africa, on behalf of the International Justice and Peace Committee of the United States Conference of Catholic Bishops. With due respect to Ms. Basu, I would like to make clear the church’s teaching, and my own views, on abortion and what we see as consistency in our defense of life. First, we believe that independent human life begins at conception. For me, that’s not hard to appreciate since I consider my own life to have begun then and can’t imagine justifying ending it at any point in its development. Second, we see the right to life of unborn children to be based on natural law, the law “written on our hearts.” The basis of the Declaration of Independence, the natural law guarantees rights that are “self-evident.” And the first among the three famous rights — the others being liberty and the pursuit of happiness — is the right to life. If one lacks that right, the others have little meaning. Although many choose not to see the consistency in this approach, the Catholic Church also opposes other life-destroying practices, such as capital punishment and assisted suicide. And based on this “ethic of life,” it favors immigration reform, the right to a living wage, early childhood education, the right to health care, and concern and help for the poor. This entry was posted in Bishop Pates, Catholic Church, Pro life and tagged Des Moines Register, Planned Parenthood. Bookmark the permalink. Can we draft him for – A) Bishop & Ordinary in charge of the new Anglican Ordinariate? 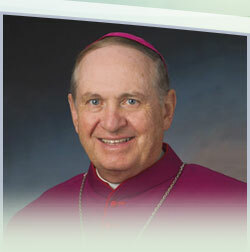 or B) Archbishop in charge of of the Archdiocese of Los Angeles if Archbishop Gomes doesn’t work out? ?